As 2013 drew to a close, I saw everywhere the signs of relief. People were eager not just to close the door on the old year but to slam it, bolt it, and perhaps hammer it shut for good measure. “Good riddance” seemed to be the sentiment. When the clock struck midnight and that big, glowing ball dropped in Times Square and people all over the place kissed their loved ones and hoisted glasses in celebration, they would turn a new page. 2014 held all the promise of a brand new notebook straight from the stationary store, and we, all of us, couldn’t wait to click our pens and start writing afresh. The old year was full of challenge and heartbreak and struggle for so many. People died. Relationships ended. Money was tight. There were illnesses and tragedy. Onward, we said to ourselves. Forward! The past belongs in the past. This year will be better. I am a strong proponent of living in the present moment. I try very hard not to time travel to the past (or when I’m deep in my anxiety, to the many possible disaster-filled futures). The secret to keeping myself grounded these days? Gratitude. In the midst of the festering crapfest life can be, I find the process of sifting through the muck for the gem-like moments of positivity is a sanity-saver. Gratitude gives us two major gifts: perspective and presence. A beloved is lost, but we feel so much pain because we loved so deeply. A relationship ends in misery, but now we are free to seek real love and meaning. The dark throws the light into sharp relief. Thank you. We are tied to the present moment when we are practicing thankfulness. We are tied to those we love and who love us back when we are appreciative of them, when we make the conscious effort to see them. 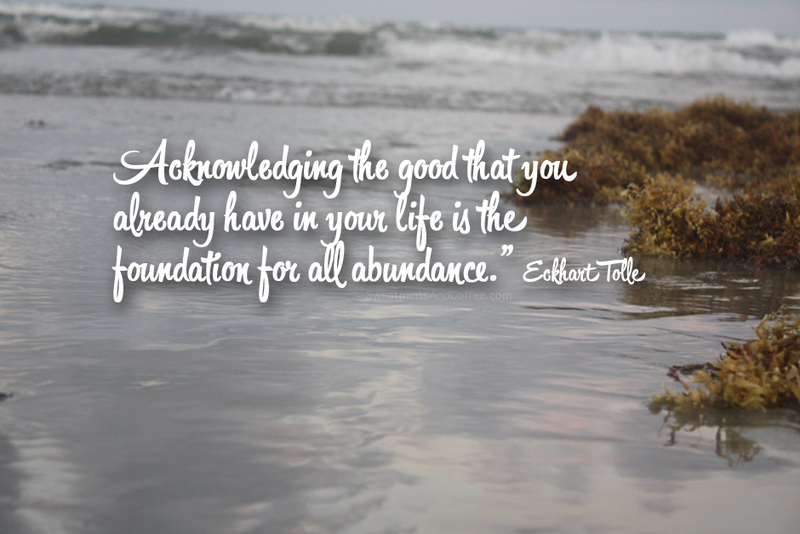 We are anchored to our authentic selves when we are grateful for the goodness in our lives, even if we have to search for it with a hazmat suit and a magnifying glass. It’s there. Thank you. I am grateful for new friends and old. I’m grateful for Sweatpants & Coffee which launched in July and has become not just a labor of love but a family. I’m grateful for coffee and sweatpants and purring cats and my amazing, hilarious, patient husband and children. I’m grateful for you.